Great for ice cream themed birthdays, baby showers, weddings, and more! High quality print on cardstock paper, these garlands are ready to hang out of the package! Garlands can tangle- be careful when unwrapping and unrolling the garland to prevent tangling. CAUTION: Keep away from small babies and children. Choking hazard. String may wrap around neck causing choking. Do NOT hang garland directly above a baby or toddler, or where it may endanger a baby. This is not a toy. PREMIUM QUALITY- Garland is printed on high quality card stock paper and ready to hang right out of the package. Simply needs hanging loops or tape to secure the garland. 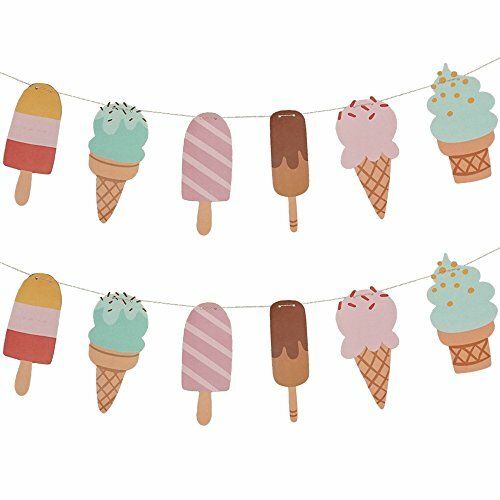 PERFECT SIZE - Each ice cream or popsicle piece is approximately 3-4 inches in width and 8 inches in height. ADJUSTABLE LENGTH - Each garland length expands to about 10 feet long (depending on how close you want the individual pieces to be to each other). Adjust it to your liking! ALL EVENT READY - Ready to use for any special events right out of the package. Perfect for birthdays, baby showers, and more! SATISFACTION GUARANTEE - Back by our 100% satisfaction guarantee. By Chloe Elizabeth. If you have any questions about this product by Chloe Elizabeth, contact us by completing and submitting the form below. If you are looking for a specif part number, please include it with your message.